This was my first book by Julie Johnstone. I have no idea how her books have escaped my attention up to now but I can assure you it won't happen again. Set in medieval Scotland, When a Laird Loves a Lady is a fast-paced, action-packed story filled with intrigue and betrayal. It's also a passionate, poignant romance between a bold, loyal, and loving young Englishwoman who yearns for a family that will love her and not view her only as a political pawn and an honorable Scottish laird who buried his heart with his late wife and has no intention of ever loving again. Put it all together and you have a story that grabbed me from the beginning and kept me flipping pages until I reached the final, sigh-worthy, conclusion, long past my bedtime. Ms. Johnstone has a gift for bringing her characters and the time in which they lived to life in vivid detail, immersing readers into a world filled with joy, despair, and danger. The intrigue, the battles, the deep emotion; I experienced it all right along with the characters. Johnstone has assembled a rich cast including many supporting characters who are fairly begging for their own stories to be told. I don't know how many books Ms. Johnstone has planned for her Highlander Vows series but I can assure you that however many she writes, I'll be first in line to buy them! Do you enjoy medieval romances? What's your favorite historical romance era? 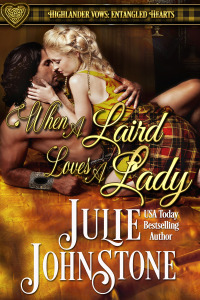 I'm gifting one randomly chosen person who leaves a comment a Kindle copy of When a Laird Loves a Lady. I do like medieval romances, and this one sounds particularly good. Thanks for the review and recommendation. I think my favorite time period is the Regency period, but I do enjoy other eras like medieval and the old American west. My favorite time period is Regency, followed by Medieval then Victorian. I like medieval then Victorian. I don't know that I have an absolute favorite, but I seem to be reading a lot of Victorian lately. Medieval Highland stories were the first romances I read and are still my favorite. It is a rugged land and was a difficult time in their history. It took strong, resilient people to survive and thrive. Intrigue abounded. All in all, a great setting for good stories.